What do I do to feel good every day? My self-care routine involves oh-so-many things, including healthy eating and exercise. And of course, as a registered dietitian nutritionist, good-for-you snacking is of huge importance to me. So read on about why I consider snacking a must, then grab my easy, nutritious mix-and-match snack list! Thanks to the folks at Sunsweet for sponsoring this post! All opinions are my own, as always. Hi, I’m Amy, and I’m a snacker. I can’t go through a day without snacks. You see, these snacks keep me from getting hungry and hangry—and they help keep me fuller for longer in between meals. This is important because staying satiated means I don’t feel the urge to snack all day long! My snack times are strategic. I have a couple of well-planned-out snacks each day—usually a mid-morning snack and a late-afternoon snack. So what do I snack on? Well, since you asked, I’ll share. I tend to mix and match my snacks, pairing a source of fiber (such as fruit or veggies) with a protein (such as string cheese or even a latte) and/or a healthy fat (like olives or avocado). Scroll down to see my full list of snack suggestions! Here’s why I plan my snacks this way. The combo helps keep me fueled so I won’t be hungry again in minutes. Fiber, protein, and healthy fat all help to slow down the speed at which food is digested. Fiber also does amazing things for your digestive system. Hang on a sec, and I’ll tell you more about those benefits. One of my current favorite snacks is prune juice. If you’ve never tasted it, the juice is surprisingly naturally sweet, and I love it chilled on the rocks. 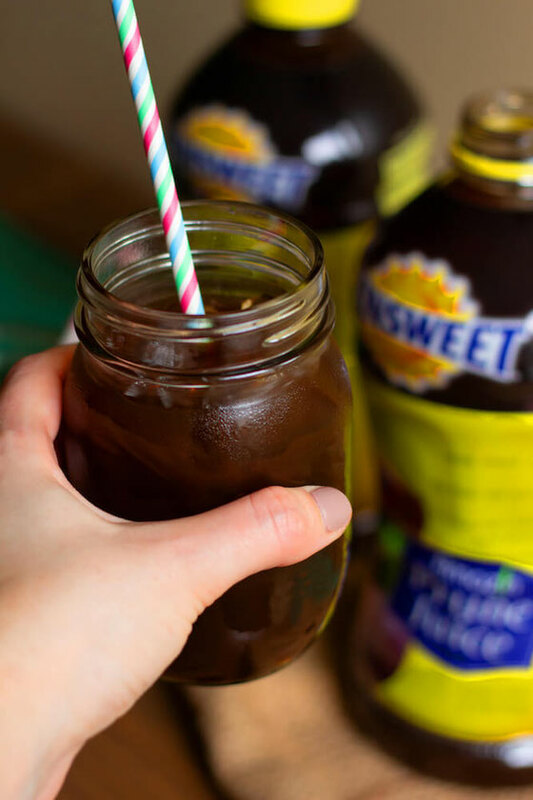 One 8-ounce serving of Sunsweet Amaz!n Prune Juice is a good source of fiber, providing 3 grams. This fiber is super important for the microbiome, the part of the body that’s made up of billions of beneficial bacteria that can help your health. 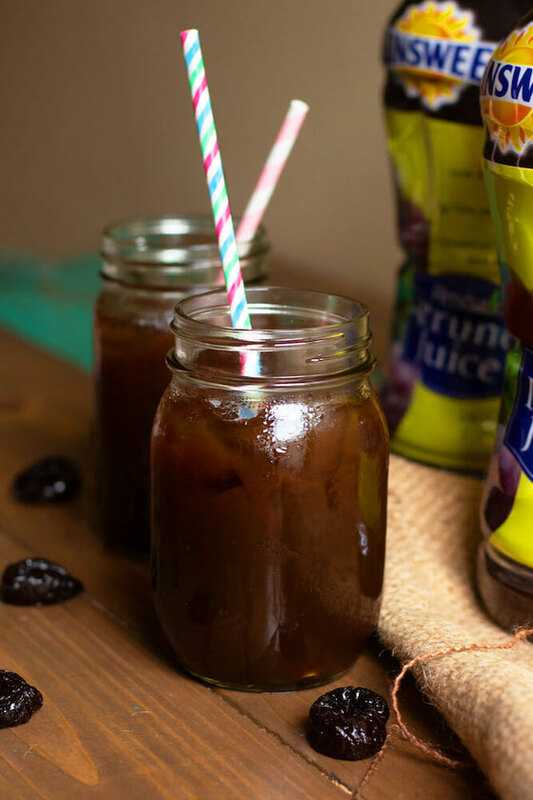 Plus, the prune juice provides vitamins and minerals that help maintain healthy digestive health. These nutrients include potassium, riboflavin, copper, niacin, and vitamin B6. Now, here’s that mix-and-match snack list I promised you, including other fave snacks like prunes, roasted chickpeas, and Greek yogurt dip. Simply pick one snack from the fiber food list and one from the protein or healthy fat list. Then eat these two items together for a healthy, balanced snack! Now that I’ve shared with you what I do to feel good, Sunsweet and I would love to hear from you! Throughout the next month (until February 15), share your self-care routine on social media with the hashtags #ToFeelGood and #Sweeps, and you’ll score a chance to win awesome prizes, including $1,000 in cash and a year’s supply of Sunsweet products! You can post about your feel-good routine on Facebook or Instagram, using #ToFeelGood #Sweeps—or you can enter directly here. And here’s the best part: Sunsweet will make a $1 donation to the National Osteoporosis Foundation for every person who shares his or her experience on Facebook or Instagram! What you share doesn’t need to be about snacking. It can be about your weekly or even monthly rituals or routines, the exercise you embrace, the recipes you love, or even the shopping list that makes it easier to eat healthy. Spread the word: Share what YOU do to feel good on social media, using #ToFeelGood and #Sweeps. I’d love for you to sound off! How do YOU snack to feel good? How do you eat to stay fueled?